My god I needed a rest today. That run on Sunday was nice, but a bit of a mistake if I'm honest; 8 days in a row with no rest from exercise is the most I've ever done and my body was telling me to take a break now please. It was lovely to run with Mr TOTKat while we're both roughly at the same pace level - he'll start running training again soon and be back to being a lot faster than me so I can't keep up any more. So anyway, rest day very much needed and to round it off, I decided to finish off the chocolate ice-cream that's been lurking in the freezer for weeks. Mmmm :o) - Available from Ocado for home delivery enjoyment! 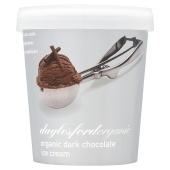 It's made with really good ingredients and is by far the nicest chocolate ice-cream I've ever had. I'm pretty tired due to lack of sleep last night. It was so hot and humid. Ick. So, early to bed tonight and up bright and early for the cycle in to work. The new southern cycle Superhighway is turning out to be a lot better than the impression the media is giving. It -isn't- pointless at all! There are huge swathes of the A3 now that you can sail along through the traffic like a bus on a bus lane. It -is- better than it was before. The road surface is so much nicer. The lane is wide enough for two cyclists abreast easily so overtaking is possible even in heavy traffic and the cars pretty much stay out of the cycle lane as much as they obey traffic lights, which is no more than you can ask and makes a huge difference to the perception of safety. I have no idea how many cyclists were using that route before, but there are loads using it now and for the most part, people seem confident and happy with the route. The really great part is being able to avoid Elephant and Castle roundabout going south in the evening rush hour. That was the only part of the journey I was apprehensive about before I tried the CS7 by-pass of that junction. 8 journeys on the Superhighway so far (including a trip in and back at the weekend) and I'm enjoying it. Being back on the tube on the way home today was a far less pleasant experience than cycling. The only thing about cycling in the morning is that it has to be early as my route starts beyond CS7 and that part gets very blocked up beyond about 07:15, so I have to leave by 7am - which gets me in to the office at 07:40, 5 minutes to put my bike away, 10 minutes to shower and change and I'm logged on and ready at 8am. 40-42 minutes to cycle in, 48-50 to get home. Same route both ways just in different directions. Go figure. Now mentioning "best chocolate icecream you've ever had" and "available for home delivery from Ocado" in the same sentence is simply not on! Meh. The ice-cream got its revenge this morning when I weighed in 1kg heavier than yesterday despite being well inside maintenance kcals, no beers, no mad salty foods... no fair! Weight Loss: How to do it!